We’re excited to announce that three pre-release offenders from Norfolk County jail graduated from the spring session of the animal care job training program at New England Wildlife Center! Thanks to the support of Norfolk County Sheriff Michael Bellotti, the inmates came to the Center five days a week for six weeks for hands-on training and learning in the growing field of animal care. Since it first started in 2014, more than 50 inmates have graduated from the program. Many graduates have gone on to secure jobs in the animal care field as well as pursue interests and build skills in other industries. 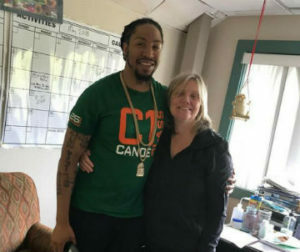 Kenneth (pictured above left with NEWC executive director Katrina Bergman) graduated from NEWC’s job training program for inmates at Norfolk County Jail in 2017. Today he is working full-time and writes, produces, and raps. The inmates worked right alongside the NEWC vet team and interns caring for wild patients, assisting with feedings, weigh-ins, X-rays, and giving medicine, physical therapy, and other treatments. 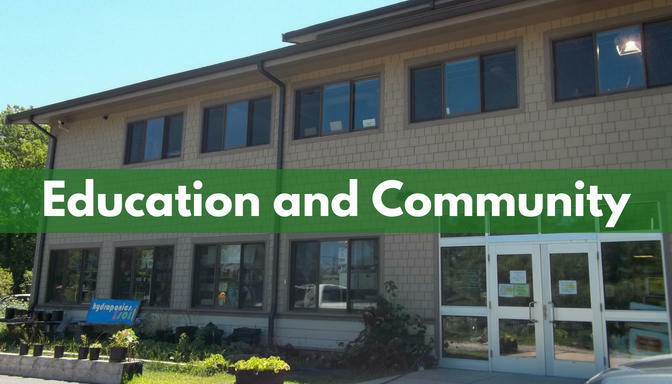 During the day, Dr. Greg Mertz, CEO of New England Wildlife Center and veterinarian at The Odd Pet Vet, and other members of the veterinary team also do classroom-style discussions with the group. They focus on specific veterinary medicine, animal husbandry, science, and technology topics all related to providing care for a variety of species. NEWC also coordinates educational field visits to Zoo New England’s Franklin Park Zoo and the National Marine Life Center so that the inmates get additional training in how to care for animals living in a zoo environment and marine life veterinary care. When wild patients are healed and ready for release, inmates get to share in the experience, too. How Does the Program Help the Community? Inmates also say they feel more confident in themselves again. They feel excited about learning and ready to take on new responsibilities and challenges. “Just coming here and being treated like a normal person really helps you think of yourself as a part of society again,” one of the inmates participating in the very first session in 2014 told the Patriot Ledger. Education is a big part of what we do at New England Wildlife Center. Giving students of all ages, abilities, and backgrounds—from Yale to jail, as we like to say—the opportunity to learn side-by-side how to care for wildlife, helps us connect to nature and each other. We very much want the Center to be a place where animals and people thrive. THANK YOU Norfolk County Sheriff Michael Bellotti, the Norfolk Sherriff’s Office, Zoo New England, and the National Marine Life Center for the opportunity to work together on this important job training program! To learn more about NEWC’s approach to education, visit newildlife.org/education.